Les canelés de saison | “Cerisier en fleurs” et “Fromage”. Here is the season of the glorious sunlight of the spring. 4th of April is the day of “An-pan” and “Dora-yaki”. They both are Japanese pastries with “Anko”, the red bean paste. It is often said people from Kanto region prefer strained bean paste while people from west like grain bean paste but how about you? In April, we have 6 selections of canelés with red bean paste; Cherry blossoms, Green tea, Apricot, Soybean flour and the 5 grains millet, Purple sweet potatoes and Green tea pistachio. Canelé is a pastry from France but it is surprisingly tasty with Japanese red bean paste. Towards the season of cherry blossom viewing, we would love you to enjoy our canelés under the cherry blossom trees as well as the flowers. Our pair of seasonal canelés for this month, “Cherry Blossom” and “Cheese” are available from today, 1st of April. 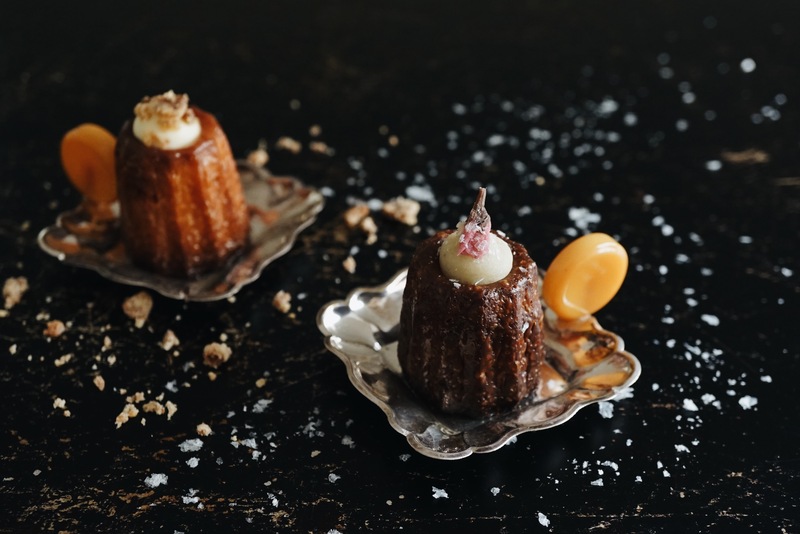 Cherry blossom canelés have delicate flavor just like the image of its fragile flower. They are decorated with cherry blossom paste and it’s pickled flowers on top of cherry blossom dough. Cheese canelés are decorated with handmade cheese crumbles and paste of cream cheese mixed with honey. The harmony of the sourness of cream cheese and mellow sweetness of honey might make you feel like taking dance steps.